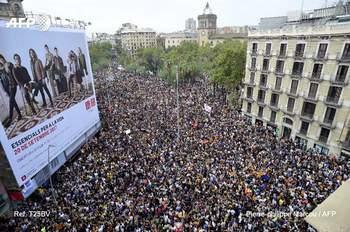 Shouting "occupation forces out" and "the streets will always be ours," tens of thousands took to the streets of Barcelona Tuesday to protest police violence during a banned weekend independence referendum in Catalonia. Columns of people converged onto the city centre as the region went on general strike, a police helicopter flying overhead, drawing angry whistles as Catalans reel from the violence that marred parts of the Spanish region on Sunday. "Closed for revolution," read a sign, while parents and children from a school used as a polling station on Sunday unrolled a giant banner on the street made by students earlier on. "Navas-Sagrera (a Barcelona neighbourhood) for peace and democracy," it read, dozens of multi-coloured little handprints above. "You can't stop the youth," said Alfredo Vidal, the 68-year-old owner of a dry-cleaning shop, pointing to the hundreds of students walking slowly by, many draped in blue, yellow and red separatist flags.